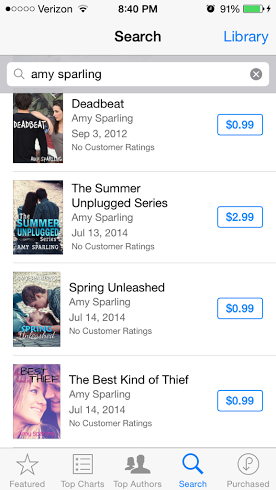 Official website of author Amy Sparling: My books are now available for Apple! My books are now available for Apple! Okay guys, please allow me to sound like a total weirdo when I say that I have no idea how Apple ebooks work. Up until just now, I was calling it iTunes, but apparently you download ebooks on iBooks on Apple? I am super excited that my books are now available for Apple products on whatever the heck their software to purchase ebooks is called. My husband took screen shots on his iPhone for me so I could see them listed in the Apple online store! 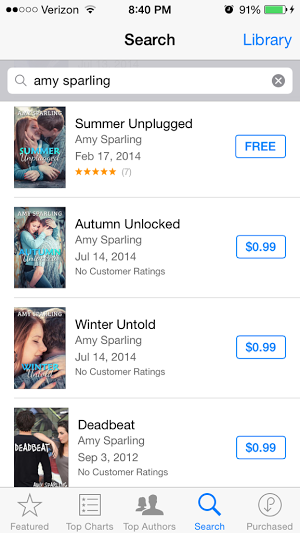 Here's a link for Summer Unplugged, my FREE novella on iBooks. So if you haven't been able to get any of my books besides Summer Unplugged, now you can! They're also available for Nook and on Smashwords.